The great thing about living in a bigger space is that there is more room for handmade things, and I love being able to display the things I make around the house. 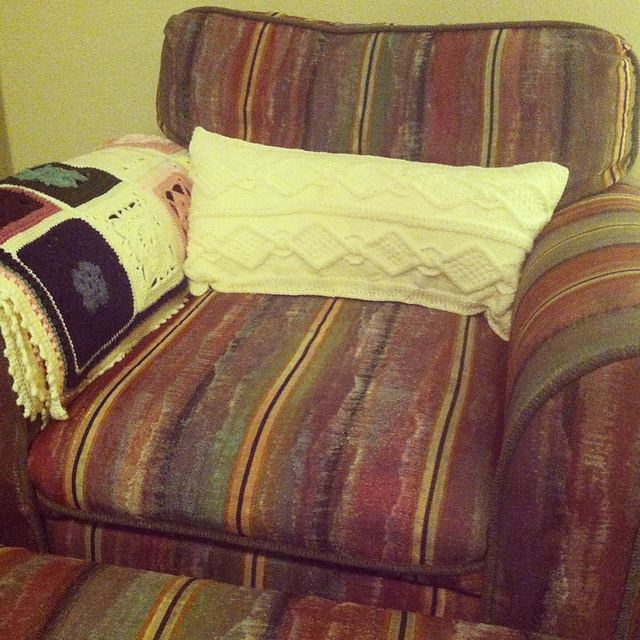 The first two yarn-related projects I did when we moved in was revamp a pillow and an old afghan. We had a plain pillow on our oversized chair, so I decided a cabled cover would help add some interest and make it more cozy. 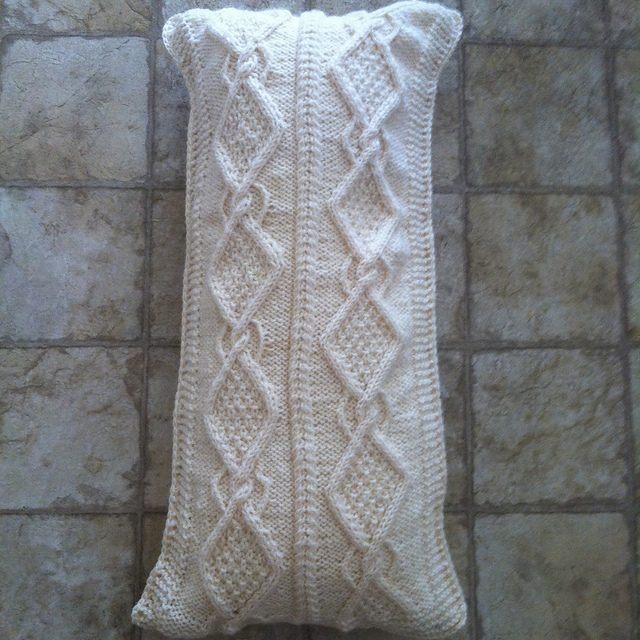 I just picked a cable pattern I liked and used the pillow itself as a template. For the back, I did plain garter stitch. Then I crocheted around the outside edges to close it around the pillow. I used yarn I already had, so this pillow got a free facelift. Next I decided to revamp an afghan I made more than 10 years ago using scrap yarn from my own stash and also from my Grandma’s stash by redoing the edging. 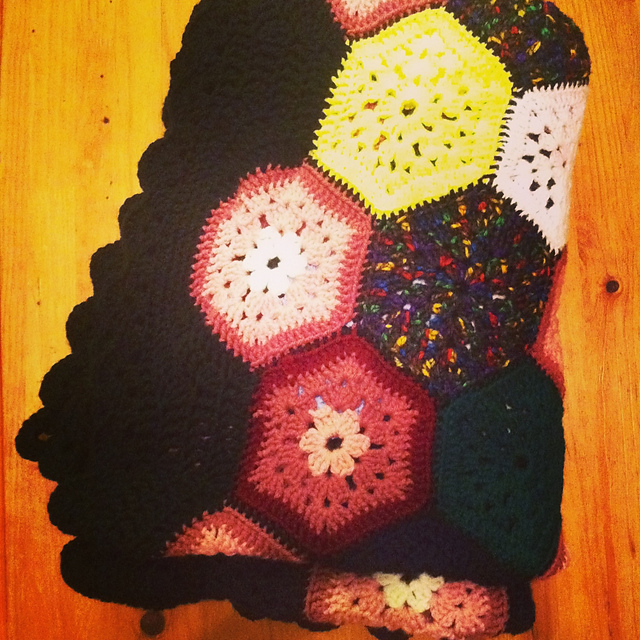 The original edging was a bad choice from the beginning (a fuzzy yarn ::shudder::), so I wanted to fill in the gaps left by the hexagons to make this a true rectangle. After some trial and error, I finally got the effect I wanted. I did some scallops around the whole thing to help even out inconsistencies, and I am so happy with the results. 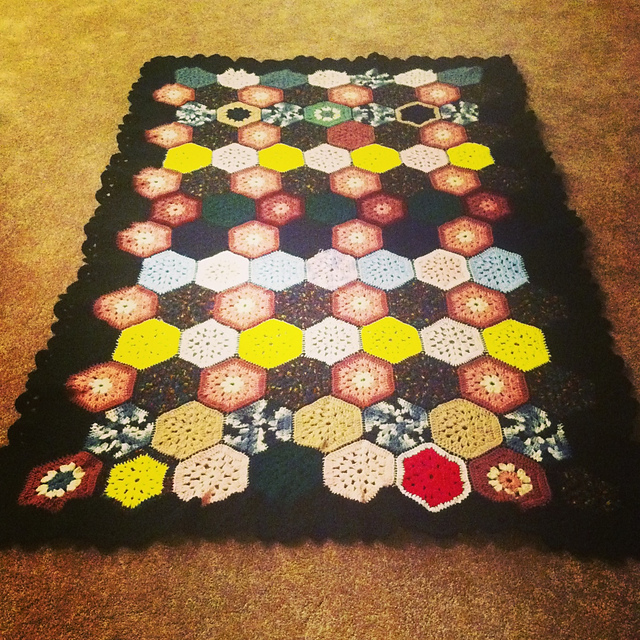 I also had to spend some time weaving in ends because back when I made this blanket, I was sloppier when it came to securing my ends. Now this blanket sits on the back of our couch, always ready to wrap someone up.